Ossature Production Company | Traditional stand and top-of-the-range pop-up store builder. Ossature Production is a traditional stand and top-of-the- range pop- up store builder. The company is also active in building showrooms as well as technological ones, in a wide range of sectors: aeronautics and defense, fashion and home business. We can help you build store layout of corner stands, reception areas, conference rooms in varied spaces: offices, hotels, museums. 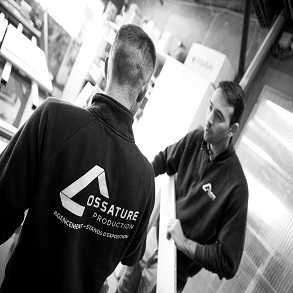 With more than 20 years of experience, Ossature Production is a thriving company. a technical room hidden by an arranged reception area with decorative strip panelling ! Pleased to belong to the finalist team World Exhibition Stand Awards ! Over 2 000 m² of workshop and storage space, our activities are now based on high-tech equipment such as a digital machining centre and saw. We put technical skills at your disposal to make your stand, showroom or outlet layout projects come true. In accordance with your validated project, we take up the challenge to construct it within the set deadlines. Our know-how and experience will maintain the quality for which we have become renowned. Digitization has not only improved our production but also refined the quality of our technical feats. A workshop of 15 professionals and a team of 20 installers are at your disposal in France and across Europe. The Quartus group is proposing its clients an innovating experience with an « Ilink » programme and its conciergerie on the island of Nantes by balancing personal and professional life in the same place. Ossature Production has co- built this place, namely the bar, the bookshelves, the LED installations, some suspended ceilings. There was a major challenge : the length of the sign (6 meters long) had to be divided into 2 parts. Fixings with hidden gaskets. To fix the sheets, you only need to clip and fit into the rib. Fitting has to be as cautious as possible as the stand will be reused several times. This is a stand made of a lot of curved lines with a high quality finish. The stand has a white and grey floor with color inlay over a perfectly flat surface. A panel where upon a full motion video was seen through the 5 cut letters of the stand signage. Richard Mille ‘s stand was a key event to which Ossature Production provided expertise with its know-how and strong skills. It’s been a great challenge : 5 places to refurbish, 6 tons of laminate, furniture, movable partitions, floor covering – and everything has to be recycled after the dismantling. Ossature Production’s involvement was full to achieve the construction of the 9th edition of the greatest historical race throughout the world. Installation of a 38 mm floor made of melaminated wood to have the exhibition area limited with reclined angle. 10 ceiling elements to be built on site. A top sign made of wood completely covered with a tarpaulin with a logo – the whole set is slung. Building the elements of an airplane fuselage, completing a nice curved form. Professional rigour was needed to set up the arches of the fuselage : 200 rounded preforms had to be set up. When you enter the fuselage under a white arch, you can see a huge wall of images covering the inside wall. Trompe l’oeil side windows (adhesives) make the atmosphere true ! Here is the blend of a traditional stand and of a modular one: our mission was to respect LENOTRE’s charter and to represent the varied activities of the school. Furniture has to keep the LENOTRE spirit - a classical style, solid as well as easy to use (daily cleaning, storage) and convenient. Walls are covered with visuals to create an illusion of mouldings. It’s been a construction game made of wood and glass, installed at a great height : neon signs, large ceilings and arches. The result is an interplay of spaces with interrupted arches. The main challenge was to keep up the date for the installation of an arch made of Zebrano melaminated boards, as a draft shield. A wall of images dominates the site and the reception area is limited by a glass panel. ...a place made of reused structures that have been modified according to the current mood. Each totem is a library and at every corner of the stand, a place for gathering comes alive : here a piece of furniture, there a discussion area. The totems are the main frames supporting the high structures, holding light and signs. This corporate stand is designed to welcome the institutional partners and to be an intelligence centre addressed to the professionals in the trade. A reception area with a kiosk made of melaminate equipped with a touch screen interface. 2 work areas with high tables with free-standing lamps. The building is based on multifunctional, thick partitions in 3 levels and includes a reception desk for demonstration equipped with a showcase. Showcases, integrated cupboards, transoms can be reused for a range of exhibitions. The exposition of Bourget, 52nd edition, was held from 19 to 25 June 2017. The stand is built on 2 levels, divided into several contoured areas and hosting appropriate situations. Here, demand for quality was combined with finite attention to the deadlines: the countdown was triggered at the very moment when the store closed until opening the following morning: it was up to the installation team to set up the corner stand in blue and light: the race was on to finish before the customers arrived! It was a stand and the objective was to make the visitors forget that they were inside a tent so the layout had to be of a top-of-the- range quality, even for a short period. ICAM is one of the 210 French engineering schools. The central theme behind this design was to create a strong identity with open offices and to elaborate a 200 m2- long red thread. The technical challenge was to produce long dimensions and to gain a nice finish. It was an enriching job, from the first 3D views to the final creation of this elegant showroom. Thanks to a touch-screen table, all the electronic operations of the room were discretely handled. Ossature Production is a traditional stand and top-of-the-range pop-up store builder. The company is also active in building showrooms as well as technological ones in a wide range of sectors. aeronautics and defense, fashion and home business. We can help you build store layout of corner stands, reception areas, conference rooms in varied spaces –offices, hotels, museums.